With over 11 500 parking bays to choose from, O.R. 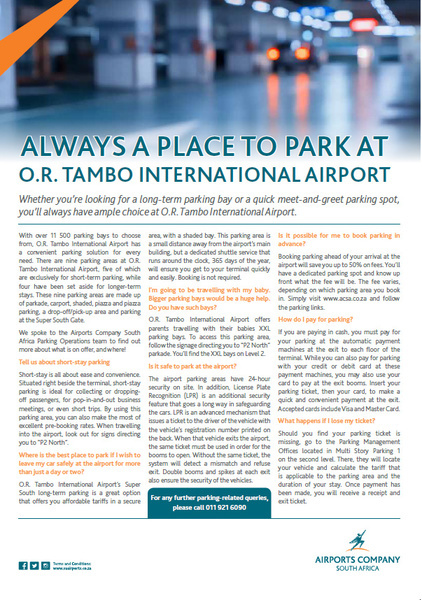 Tambo International Airport has a convenient parking solution for every need. There are nine parking areas at O.R. Tambo International Airport, five of which are exclusively for short-term parking, while four have been set aside for longer-term stays. These nine parking areas are made up of parkade, carport, shaded, piazza and piazza parking, a drop-off/pick-up area and parking at the Super South Gate. 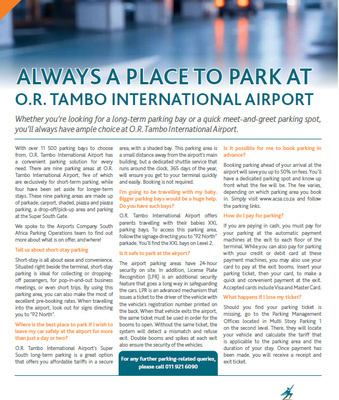 We spoke to the Airports Company South Africa Parking Operations team to find out more about what is on offer, and where! Short-stay is all about ease and convenience. Situated right beside the terminal, short-stay parking is ideal for collecting or droppingoff passengers, for pop-in-and-out business meetings, or even short trips. By using this parking area, you can also make the most of excellent pre-booking rates. When travelling into the airport, look out for signs directing you to "P2 North". Where is the best place to park if I wish to leave my car safely at the airport for more than just a day or two? O.R. Tambo International Airport's Super South long-term parking is a great option that offers you affordable tariffs in a secure area, with a shaded bay. This parking area is a small distance away from the airport's main building, but a dedicated shuttle service that runs around the clock, 365 days of the year, will ensure you get to your terminal quickly and easily. Booking is not required. I'm going to be travelling with my baby. Bigger parking bays would be a huge help. Do you have such bays? O.R. Tambo International Airport offers parents travelling with their babies XXL parking bays. To access this parking area, follow the signage directing you to "P2 North" parkade. You'll find the XXL bays on Level 2. Is it safe to park at the airport? The airport parking areas have 24-hour security on site. In addition, License Plate Recognition (LPR) is an additional security feature that goes a long way in safeguarding the cars. LPR is an advanced mechanism that issues a ticket to the driver of the vehicle with the vehicle's registration number printed on the back. When that vehicle exits the airport, the same ticket must be used in order for the booms to open. Without the same ticket, the system will detect a mismatch and refuse exit. Double booms and spikes at each exit also ensure the security of the vehicles. Is it possible for me to book parking in advance? Booking parking ahead of your arrival at the airport will save you up to 50% on fees. You'll have a dedicated parking spot and know up front what the fee will be. The fee varies, depending on which parking area you book in. Simply visit www.acsa.co.za and follow the parking links. How do I pay for parking? If you are paying in cash, you must pay for your parking at the automatic payment machines at the exit to each floor of the terminal. While you can also pay for parking with your credit or debit card at these payment machines, you may also use your card to pay at the exit booms. Insert your parking ticket, then your card, to make a quick and convenient payment at the exit. Accepted cards include Visa and Master Card. Should you find your parking ticket is missing, go to the Parking Management Offices located in Multi Story Parking 1 on the second level. There, they will locate your vehicle and calculate the tariff that is applicable to the parking area and the duration of your stay. Once payment has been made, you will receivea receipt and exit ticket.